The roof exhaust unit, REU, with either a IP 33 or 54 protection degree, is easy to install thanks to its click-in feature. This is a good solution when there is limited space on the enclosure's door or side panels. Roof exhaust unit for mounting on the top of the enclosure, providing natural ventilation. The unit is easily installed with a quick fastening system. Filtration efficiency of >90% for the IP 54 unit (REU05R5). Painted mild steel, and injection-moulded thermoplastic (ABS-FR) self extinguishing, UL94V0. -15 °C to +55 °C. IP 33 No filtermat, IP54. Filtermat. Roof exhaust unit with a click-in installation feature and a IP 33 or 54 protection degree. The exhaust unit can provide ventilation to enclosure's that do not have enough space on the door or side panels whether standalone or as part of an enclosure assembly. The click-in feature reduces the customer's labour cost due to the ease of installation. 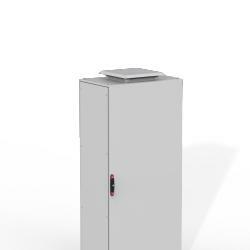 Floor standing enclosures can be ventilated independently of each other, if required. The roof exhaust unit should be installed together with at least one exhaust filter, EFA, or filter fan, EF.